Run flat tyres are specifically designed to be capable of travelling some distance despite a puncture. Also referred to as self-supporting tyres, they are built to operate even at zero pressure. The ability to drive with a completely deflated tyre, makes run flat tyres a versatile and safer option. With a run flat tyre, you are always equipped to handle the inconveniences caused by a puncture. Your journey will not need to stop and you can continue driving for a certain distance without having to change your tyre. Moreover, the unique construction of the tyre considerably reduces the probability of a dangerous tyre blowout. Conventional tyres need air to remain rigid. However, run flat tyres are built with a reinforced sidewall, which ensures that the tyres stay rigid even in the absence of air pressure. The reinforced outer shell of the tyre helps to keep the rubber intact without the air. This enables the tyre to support your car even with a deflated tyre. The tough rubber inserts temporarily support the weight of your vehicle to provide a run-on period after a deflation. Reduced risk of a tyre blowout. Eliminates the need to change the tyre at the roadside or in unfavourable conditions. Save space and weight by not having to carry an extra tyre. Reduced probability of being stranded. After a run flat tyre suffers a puncture, there is a limited distance that you can drive. You can drive for another 80 kilometres at 80 kph. This distance is hopefully enough to reach the next garage to get your puncture repaired or to any other safe location. The exact distance that you can travel is also determined by other variables like the load of the vehicle, the conditions you are driving through and your driving speed. With the rise in demand for run flat tyres, an increasing number of manufacturers are preferring to fit new vehicles with run flat tyres. So, if you buy a new BMW, Mini or Mercedes, it may have a run flat tyre. This also means that the spare tyre and changing tools will not be included. 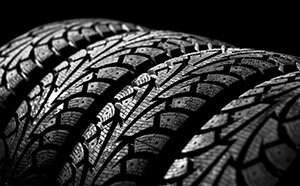 In case your car has originally been fitted with a run flat tyre, it is possible in most cases to shift to conventional tyres. In most instances, people prefer to make the shift as conventional tyres are cheaper and easily available. However, if you are planning to change, it is important to keep in mind that the manufacturer has developed the vehicle and suspension exclusively for run-flat tyres. When you change to normal tyres, there are inconveniences associated. You may also not have a spare tyre in the event of an emergency. Most of the run Flat tyres can be repaired. However, as it is for conventional tyres, run-flat tyres can only be repaired for damages to the crown of the tyre. A damage to the sidewall or shoulder of the tyre makes the tyre irreparable. Before any repair process is undertaken, it is important to inspect the tyre thoroughly to figure out any internal damage. Every tyre has its own characteristics and it is advisable to follow the instructions of the manufacturer when planning to mix tyres brands. It is always recommended to fit the same brand and type of tyre along the axle of the vehicle. This will ensure that the two front tyres match each other. 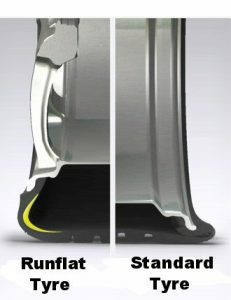 Run flat tyres are built with the same materials as used to manufacture conventional tyres. This suggests that the rate of wear of the two tyres are similar. Maintaining the tyres by ensuring that the correct air pressure is maintained is the best way to prolong the life of a run-flat tyre. If your vehicle is fitted with a run flat tyre and you are using it to tow another vehicle, then care must be taken. The additional weight of the vehicle being towed exerts pressure on the tyres. If a puncture occurs, you may experience issues with the stability of your vehicle even after abiding by the speed limit set by the manufacturer of your run flat tyre. For safety reasons, it is important to reduce the speed and the distance travelled with the punctured run-flat tyre. At Mobile Tyre Shop we believe in replacing like with like. In other words, it is best to stick to run flat tyres if your vehicle was originally fitted with it. Making a shift can lead to an adverse impact on the handling as the vehicle’s suspension was originally equipped to suit run flat tyres. However, if you still prefer to change to conventional tyres, we are here to make it easy for you. We are available from 7:00 AM to 7:00 PM on all 7 days of the week to assist you.